When Will The Oscars Ditch The Gendered Acting Awards? An actor, a writer and an awards forecaster discuss the possibility of gender-blind acting categories at the Academy Awards. In a photo collage of the year’s Oscars acting nominees, it’s the uniformity that catches the eye: row upon row of alabaster-skinned actors and actresses. Not a single actor of color was nominated for an acting Academy Award this year, for the second year in a row. Once again, each televised reaction shot and each emotional acceptance speech will come from a white actor. In 2016, the unrelenting whiteness of the Oscars seems astonishingly retro; did no one tell the Academy that this is the age of #BlackLivesMatter and the term "microaggression" hitting mainstream? The women’s representation in the acting nominee pool, on the other hand, is impeccable -- for every male actor nominated, there’s a female one. There’s no overwhelming masculinity in the well-groomed lineup to offend the eye. 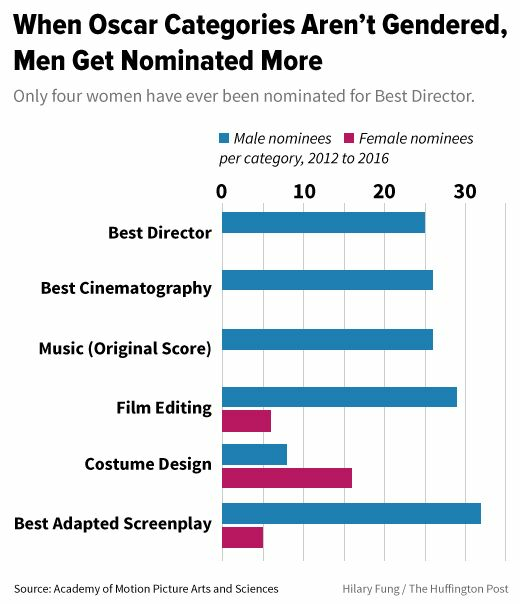 Of course, this gender parity can be explained quite simply: Men and women do not compete against each other for acting awards at the Oscars, but in separate “Best Actor” and “Best Actress” categories. Boom, instant equality. Performance awards need not be divided by gender, however. Five years ago, the Grammys merged its remaining gendered categories into unisex ones, such as Best Pop Solo Performance. The Television Critics Association Awards designate one prize for individual achievement in comedy and one in drama, no “actor/actress” distinctions. Most of the Oscars simply go to the "Best Director," not a best male and a best female director. Would the notoriously hidebound Academy ever consider merging “Best Actor/Actress” and “Best Supporting Actor/Actress” categories together, or even replacing them with an altogether new, gender-blind set of acting categories? And what would such a change mean for actors who aren’t men -- specifically cisgender, straight men? “It really doesn’t make all that much sense to have gendered categories. An actor is acting,” Vanessa Vitiello Urquhart, who writes about gender and sexuality for Slate, explained to The Huffington Post. Acting isn’t an inherently masculine or feminine activity, she argued, so why treat performances by men and women as if they’re apples and oranges? With transgender and even, more recently, non-binary-identifying actors creating buzz in the industry -- think of "Orange Is the New Black"’s breakout stars Laverne Cox, who is transgender, and Ruby Rose, who identifies as gender fluid -- the staid, cis-normativity of the traditional actor and actress categories stands to cause problems. Old-school prejudices about whether transgender men and women are “really” men and women, respectively, could conceivably create friction around the process of nominating those actors for their performances in the correct categories -- or at all. Because the award is presented in a gender binary, the discussion can suddenly become about gender, not just the strength of the performance. However, for Billings, who has been working as a transgender actress for decades, the thought of removing the gender split in the awards is somewhat bittersweet. “If you think about the history of the gender revolution, it has always been ... maybe not always, but it’s been founded in assimilation,” she told me. “When I first started my transition, it was all about, how do I behave, look and sound like the Americanization of the modern female?” The separate actress category provides an opportunity for trans women to be openly recognized not just as performers, but as women performers. It’s not an opportunity the Academy has taken advantage of, as of yet. No transgender actor has even been nominated for an acting award, though many hoped Mya Taylor, the star of indie comedy “Tangerine,” would be the first this year. Though Taylor’s performance failed to earn a nomination, a cisgender man did garner a nomination for playing a trans woman -- for the second time in just three years. Jared Leto actually won the Best Supporting Actor award in 2014 for his portrayal of a transgender woman in “Dallas Buyers Club.” While Eddie Redmayne, nominated for Best Actor for playing an artist who undergoes one of the first gender confirmation surgeries in “The Danish Girl,” is not favored to win, he did take home the gold statuette last year, so he’s not exactly a long shot either. While trans actors remain practically invisible at award shows, genderqueer actors might have no option but to be invisible. As a performer who doesn't identify as a man or a woman, they can't simply be slotted into a Best Actor or Actress nomination. “The binary imposes certain limitations,” Urquhart told me, though she emphasized that the problem starts well before the award level: "We haven’t had a lot of roles that I know of that don’t break down into a male role or a female role ... I don’t think the roles are really there right now to get outside the binary." Diverse representation is exactly where the Academy Awards are already failing, especially where it comes to people of color and LGBTQ members of its community. And the gender breakdown in the acting awards might pose a dishearteningly old-fashioned dilemma for actors who identify off the binary, but simply removing it would likely have a much more immediately negative effect on diversity and parity in the awards. O’Neil made his forecast in assured terms, but the way he sees it, there’s simply little doubt about how a unisex acting award would play out. “You’ll see what you’ve seen many years at the TV Critics Association Awards where they don’t have a gender distinction,” he argued. A quick count of the Association’s past award-winners bears him out: In the categories for individual achievement in comedy and in drama, women make up barely over 25 percent of past winners. In 2013, Pacific Standard went so far as to argue that all Oscar categories should be separated into male and female divisions, as a strategy for addressing rampant inequality in the non-acting awards. Only four women, for example, have ever been nominated for Best Director, and only one took home the prize. This year's non-acting nominations are plagued by the same white, cisgender male bias that Pacific Standard called out two years ago, and a sampling of the non-acting individual awards from the past five years show it's not just a fluke: It's a trend. Recently, with awareness of genderqueer identities on the rise, periodic calls to break down the gendered wall in the acting category have sounded. Writer Lux Alptraum wrote last month in Quartz, "in the same way that the blinding whiteness of the 2016 Oscars has brought attention to racial discrimination within Hollywood, an entirely male slate of acting nominees might force us to finally confront Hollywood’s bias against women." In 2010, researcher Kim Elsesser argued in The New York Times, "The divided Oscar categories merely insult women, because they suggest that women would not be victorious if the categories were combined." It's hardly an insult to women, however, to acknowledge that the Academy has a dreadful record recognizing the work of anyone who isn't a white, straight, cisgender man. The awards depend heavily on the choices of an Academy that, as surveys have shown, is overwhelmingly white and male. All the outrage in the world may not be enough to overcome that level of bias, whether it's #OscarsSoWhite or a campaign for gender equality. These calls for unisex acting awards, unsurprisingly, generally come from outside the industry. The immediate and likely loss of recognition faced by actresses -- who already deal with heavier doses of ageism and physical perfectionism than their male counterparts, while being offered fewer and less meaty roles -- clearly doesn't appeal to the women of Hollywood and those who represent them. In a statement to HuffPost, New York Women in Film & Television Executive Director Terry Lawler expressed strong support for the gendered categories as a means of ensuring female representation in the awards: "We are in favor of keeping the Best Actress and Best Supporting Actress categories in the Oscars until such time as there is full equality for women at all levels of our business in terms of opportunity, compensation and recognition.” A 2013 Associated Press article quoted stars including Sally Field and Naomi Watts defending the gender split in the acting category. "The percentage of roles is so weighted toward actors," Field told the AP. 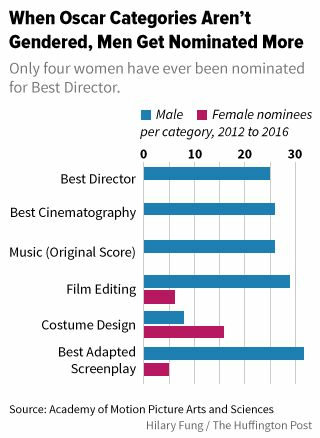 Without equal roles, and fair treatment from the Academy, actresses probably wouldn't fare well in a genderless competition. Debates about the Oscars, which only go to a small fraction of industry professionals each year, can seem like sheer vanity. "For all the weight that awards carry in the world of movies, they are just awards," Alptraum wrote. She's right that awards can't replace equal pay or job opportunities, but the visibility they offer benefits both the actors themselves and young people who are able to see themselves reflected in their idols. "These awards shows saved my life when I was little," said Billings. "But I never saw myself. And now we’ve got a chance to do that. So let’s just keep that going."